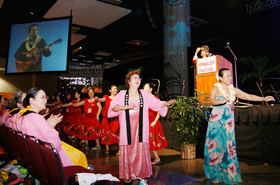 The Friendship Gala was held on Saturday, March 12, 2011, at the Hawaii Convention Center. Many guests have already gathered from the morning to enjoy this event. The door was closed at 5:00 p.m. and reopened at 7:00 p.m. There were guests that were dressed up in the night-time which brought a party like atmosphere. This is a place for people from countries of the Asia-Pacific region such as Hawaii and Japan to foster international goodwill and establish relations with the locals. 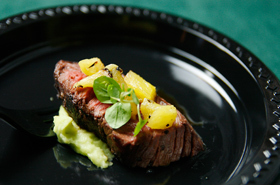 Also, there were popular gourmet restaurants of Oahu which offer variety of dishes, where the guests can enjoy all the great foods at once. 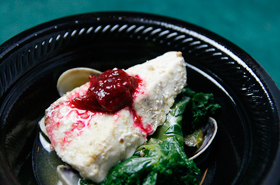 Each restaurant showed off their favorite dishes for the Friendship Gala! 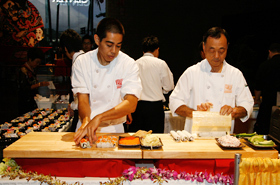 Many of the guests gathered by the booth of Shokudo Restaurant, where experienced sushi chefs were rolling a California roll in front them. The California sushi roll was introduced as the American style gourmet to the Japanese guests. Furthermore, the Morimoto Waikiki received the most attention, which is a Japanese cuisine restaurant that opened this year. It is owned by the famous chef named Morimoto, who appeared on the show called the “Iron Chef”. 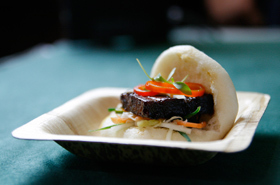 Many of the guests made a visit to taste their favorite dishes. This is Hunger Steak served by BLT Steak. The pineapple gives it a bit of kick. This is Mustard seed crusted Nairagi with steam clams served by Mariposa. This is Steamed Bun with Kakuni served by Morimoto Waikiki. 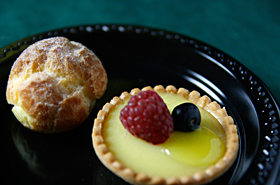 This is Choux a la creme and lemon tarte served by La Palme D’or Patisserie. This is a demonstration of sushi rolling by the sushi chefs from Shokudo Restaurant. 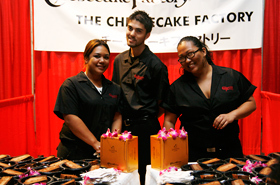 They are the staffs of The Cheese Cake Factory. 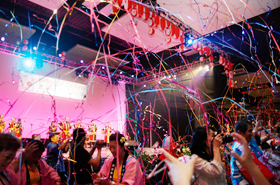 The stage performances began after stuffing our stomach with tasty dishes and refreshing liquors. The honorable guests such as Peter Carlisle, who is the Mayor of Honolulu and others gave a brief speech. 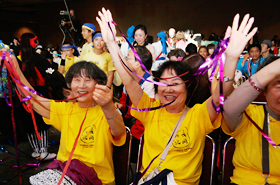 Also, a commendation ceremony was held on stage for those devoted participating groups of the Honolulu Festival. Afterwards the performances resumed. 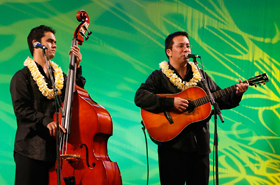 The special guest this year was Hoku Zuttermeister, who won the 2008 Na Hoku Hanohano Awards, which is equivalent of the Grammy Awards. He played Hawaiian music which reminded of a pleasant tropical breeze of Hawaii. 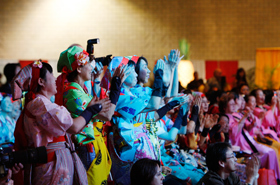 When the popular hula song started playing, the participating groups of Japanese hula dancers began dancing. Next appeared was Dai Hirai, who is a Japanese ukulele player that performed last year. He played the theme song for the Honolulu Festival titled ONE LOVE -Pacific Harmony- with the children of Niu Valley Middle School Concert Band. Hoku Zuttermeister is performing on stage. 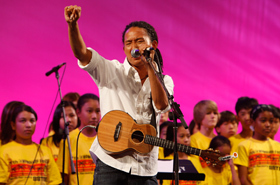 Dai Hirai, who is a Japanese ukulele player with the children of the Niu Valley Middle School Concert Band. 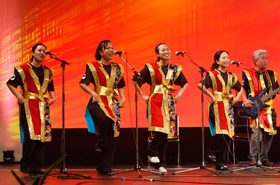 Sugaizanairen is a must for the stage performance in the Friendship Gala. They’ve been participating since our first Honolulu Festival to the present, which there are many who anticipate to watch their show every year. 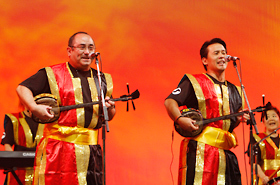 The last performance featured Okinawan music by the members of the Hawaii United Okinawa Association. Their cheerful music brought the excitement and the audience started to dance. 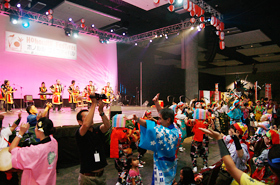 Afterwards, the second day of the Honolulu Festival came to an end. 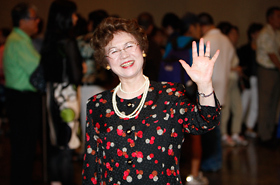 The cheerfulness of Okinawan music brought excitement. The audience stood and danced together at last! Suddenly, various colored tapes came out high in the ceiling. A joyful laughter and a round of applause filled the venue.